Shelby Landers and Matthew Mangold - both students at Capital Area Career Center - nail siding to the front of the house they’re building in the trades class. Landers says he’s happy to get out of the classroom and get more hands-on experience. 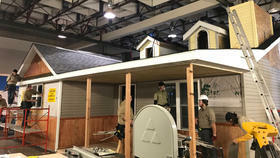 On a recent Tuesday afternoon, a few high school students are measuring and cutting siding. They’re building a house in the trades class at the Capital Area Career Center in Springfield and learning construction skills, like putting on a roof or installing a window. Shelby Landers is one of the students hammering siding on to the front of the house. The 17-year-old senior says he was happy to leave the classroom and get more hands-on experience. “I’m learning this so I can go out and work for a construction company and do something with carpentry or pick up a new trade after high school,” he said. Despite his excitement, he says his peers don’t get it. He says he doesn’t plan to go to college, like many of his classmates. Getting the job he wants – in carpentry or machine operation – would mean getting a union apprenticeship instead. There’s increasing support from both the federal and state government for training in traditional careers, like construction trades, and new paths, like healthcare and information technology. Governor-elect J.B. Pritzker touted his plans for funding vocational programs on the campaign trail. And over the summer, Congress reauthorized more than a billion dollars for training programs in high schools and community colleges. The goal is to prep students for a job or more training after high school in fields that need skilled workers. For example, jobs in construction trades are estimated to grow by more than 13,000, or about 7 percent, between 2016 and 2026, according to numbers from the Illinois Department of Employment Security. But supporters say one persistent challenge is the laser focus on preparing kids for college, and overcoming the idea that college is always the best option. “Parents come in and say, my kid don’t want to go to college. And when they said that, they said it like it was a bad thing,” said Wes Aymer, principal at Capital Area Career Center. He says he has to make the case that it isn’t, and there are good careers that require technical training after high school. There is economic data to support the focus on earning a college degree. On average, workers with a college degree do make more than those without one. According to the U.S. Bureau of Labor Statistics, the median weekly wage for workers with a bachelor’s degree is close to $1,200, while the median for those with an associate’s degree or some college education is less than $1,000. But, Kate Blosveren Kreamer – deputy director of Advance CTE – a national advocacy group for career and technical education programs like the one in Springfield – points out that demand for skilled workers is growing and expanding to new fields. “The labor force is changing so rapidly, and there are so many new opportunities and new sectors and new careers that many years ago, we didn’t know how to prepare individuals for them,” she said. To help students find those new opportunities, the education system is trying to change, too. With the funding Congress approved last summer for career education, the Illinois State Board of Education is creating a new five-year plan for its career and technical programs across the state. Eugene Phillips is one example. He’s studying computer networking at CACC — not to find a job right out of high school, but to help figure out which career path is right for him. “I have always been programming. I’ve always (been) messing around taking like PlayStation apart and things like that (since) I was in middle school, I built my computer and I still use it to this day,” he said. He says the CACC program has helped him figure out which jobs are available in the information technology field. Those jobs continue to grow – and industry estimates put the number of needed workers in cybersecurity at almost two million worldwide by 2022. In Illinois, computer-related jobs are expected to grow by nearly 20,000 in the next eight years. For Phillips, it’s not technical training or college – it’s both. He has already earned an industry-recognized certification that would qualify him for some jobs. And he plans to get a bachelor’s degree and maybe eventually a master’s. “Having that degree will open up doors for me that I don’t have without a degree,” he said. Kreamer, with Advance CTE, says providing a variety of choices is key. She says what’s important is for students and their parents to make an informed decision. As parents and students think about what comes after high school, she says discussions need to include all the options, not just college. Next post: What Happens To Pot Convictions If Illinois Legalizes?